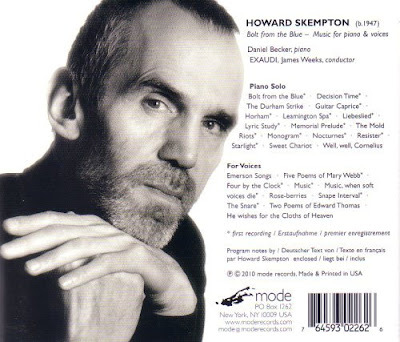 Howard Skempton's music has developed without regard for contemporary fashionable 'isms'. He studied composition with Cornelius Cardew and was a founder member Cardew's Scratch Orchestra in 1969. Skempton's music is characterised by its extreme economy and he has writen a large number of pieces for solo piano or accordion. Bolt from the Blue is a new CD from the New York based Mode label which was Alex Ross' 2009 label of the year. It brings together Howard Skempton's piano miniatures and music for voices in an intelligently planned and beautifully executed programme. 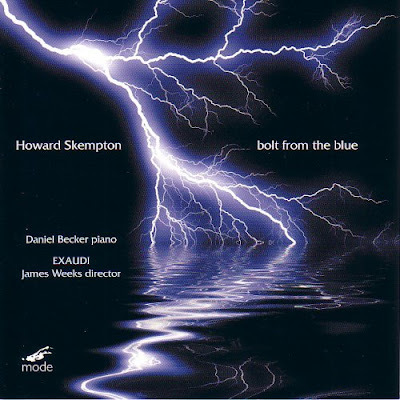 The pianist is contemporary music specialist Daniel Becker whose contribution, which includes the title track, is captured in the piano-friendly acoustic of Potton Hall here in East Anglia. Exaudi directed by James Weeks provide the choral contribution which was recorded in St Silas, Chalk Farm. This is an outstanding disc of genuinely original and beautiful music. It comes from an important composer who remains outside contemporary music's fashionable inner circle and it would be very surprising if many (any?) of the works on it are already in reader's CD collections. It is also a true Christmas delight that avoids the two high Cs of Cowell (Simon not Henry) and Cage (John not Chris Palko). Need I say more? * A podcast interview with James Weeks in which I discuss with him Exaudi's recording of Elisabeth Lutyen's vocal music can be heard here. Well, Well, Cornelius is a collection of 44 of Skempton's quiet and short piano pieces on the Tilbury label. Laurence Crane works in a similar vein, there is a CD called "Laurence Crane: 20th Century Music" on the Metier label. For a very different approach to reed based hand held instruments, try some of Pauline Oliveros' improvisations for retuned piano accordion. She is working on the practice of listening. Some samples on YouTube, together with a rather scary 'workshop'. "it would be very surprising if many (any?) of the works on it are already in reader's CD collections"
Well, since 19 of the 26 pieces haven't been recorded before, probably not many ...! It is an excellent CD though and yes, a good one for Christmas. Eamonn wrote "Never heard his music so looking forward to checking it out." Lento and Well, Well Cornelius both get played regularly in our household. I had quite a shock when the picture of the cover of the new CD appeared on my screen, as I had been holding the CD itself in my hands only 30 minutes ago, in The Outback in Hereford. I then put it back an purchased Stile Antico's Puer natus est, having heard it last night with friends. Bob, I'm not sure how many readers you have in the Marches, but I've just phoned the shop and got them to put it on oneside for tomorrow. Two Christmas presents to myself in two days - is this in the spirit? Bob, just wanted to wish you a merry Christmas and thank you for sharing so much wonderful music. Shukriya.